What is a Certified Wildlife Habitat anyway? This is a program sponsored by the National Wildlife Federation which certifies you have completed all the requirements necessary to provide for the sustainability of various types of wildlife in your residential or commercial area. 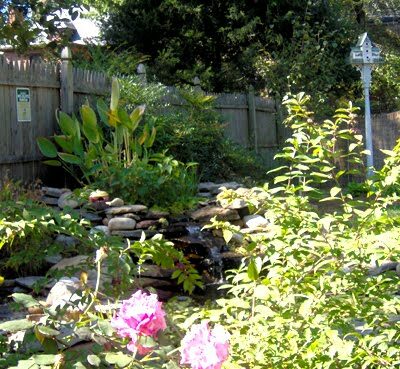 If you are feeding birds, have a birdbath and are growing trees and shrubs on your property you already have fulfilled a few of these requirements. The rest is really quite simple, and you do not need a 20-acre farm or anything close to that to have a Certified Wildlife Habitat. For me its about spreading the word on the importance of preserving and/or replicating the natural habitat that is essential for wildlife to thrive. It is no secret that across the world animal habitats are shrinking with devastating results, including the endangerment of many animal species. There is a very small fee required for certification along with an easy form to complete on their website. You will need to upload photos of your areas which, if you are like me and love taking photos of your gardens, you probably already have! 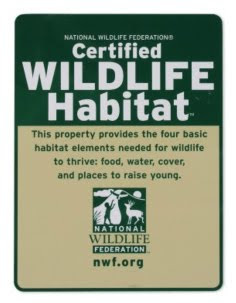 After you have completed the requirements the NWF will send you a small sign to post in your habitat. Fancier signs are also available. Below is a list of the NWF’s Certified Wildlife Habitat requirements. Each one is linked to more detailed information available on the NWF website.